The strings on a guitar have a direct impact on the sound quality of the instrument. With frequent cleaning, you can extend the life of your guitar strings for several months, but there comes a time when the strings are simply too dirty or worn out to provide the tone you need to make your playing sound good and in tune. Changing strings on your guitar is one of the first things a guitar player should learn. Changing the strings on your guitar doesn't take long and will help ensure the tone of your guitar is always at its best. Open your pack of new guitar strings and lay them out in the order they appear on the guitar. Guitar strings typically come in individual strings inside the package, with each sleeve marked to indicate its position on the guitar. Placing them out in front of you helps you keep the order correct. Remove the old strings on your guitar by turning the tuning keys until the strings are loose enough for you to unwind the strings and remove them. Wind the old strings before you throw them away. The ends of the strings can poke into your skin or tear your trash bag. Rolling them helps prevent this. Place the new strings on your guitar. It doesn't matter on which end you start. Remove the new string from its sleeve, unwind it and insert the thin end of the string through the appropriate hole in the bridge of your guitar. Pull the string up to the appropriate tuning key and slip it through the hole in the tuning key mechanism. Use tweezers to pull the string through the hole if you have trouble getting hold of it with your fingers. 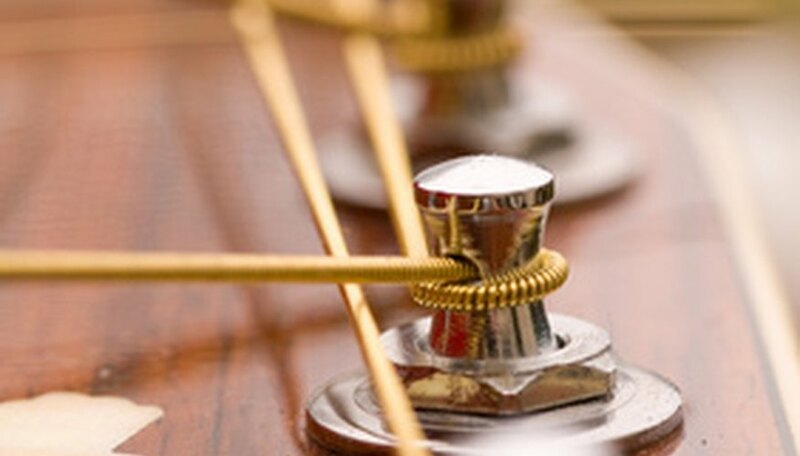 Pull the string until it begins to tighten, then wrap it counterclockwise around the base of the tuning key to ensure the string stays in place. Tie the string off in a knot to keep it from slipping. Follow this method to put each string on the guitar. Tighten each of the tuning keys until the strings begin to pull taut. You're not going to tune yet, so just barely taut will do. Check to make sure none of the strings are slipping, which will cause your guitar to go out of tune. Pull each string up away from the fretboard until you feel resistance. Do this to each string several times. This is breaking in the strings. New strings will stretch as you play them, so stretching them ahead of time will help your guitar stay in tune once you tune it up and begin to play. Tighten the strings alternately. Begin with the thinnest string and tighten it just a little, then move to the thickest string. Continue doing this to all six strings, working your way to the center. Alternately tightening the strings evenly distributes tension on the guitar neck. When the strings are close to the appropriate tightness, it's time to tune them. Use an electronic tuner if available. If not, tune your guitar to a reference note. Cut the excess string away, using wire cutters or scissors. The excess string protrudes from your tuning keys. Leaving it on is a good way to poke your eye out. Snip each string to about a half-inch from the base of the tuning keys. Purchase a guitar string winder to make tightening your strings easier and faster. A string winder is a simple plastic attachment that fits over your tuning keys and allows you to turn the keys without continually stopping. String winders are cheap and you can find them in just about any music store.